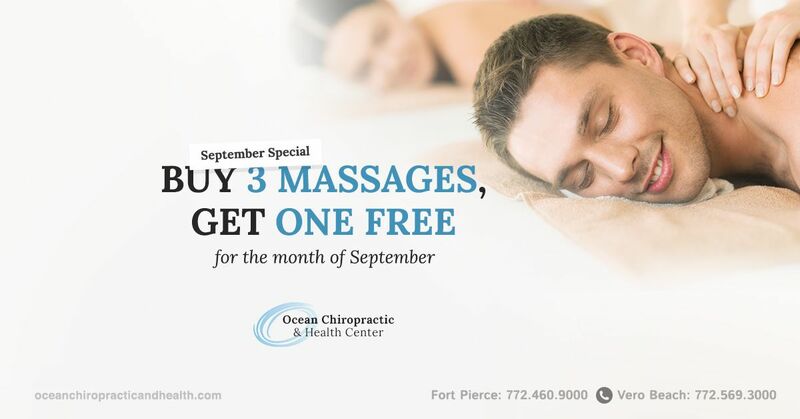 Welcome to Ocean Chiropractic and Health Center, your Fort Pierce Chiropractor. Fort Pierce chiropractor Bradley Deiner, DC of Ocean Chiropractic and Health Center is celebrating 10 years of treating patients in the Fort Pierce area. Bradley Deiner, DC is a chiropractor committed to providing drug-free health and wellness so that you may achieve the best quality of life possible. At our Fort Pierce Chiropractic and Health Center, you will receive the best care through the use of modern chiropractic techniques. Ocean Chiropractic and Health Center also offers treatment for auto accidents, slip and fall and worker's compensation accidents. In addition, Ocean Chiropractic and Health Center also offers; massage therapy, posture screenings, school, sports, and DOT physicals as well as nutritional counseling and weight loss. ​​​​​​​At Ocean Chiropractic and Health Center, we take great pride in providing the finest chiropractic wellness care to patients of all ages. Below is a selection of the different chiropractic and wellness services we offer in our Fort Pierce office.